The Thunderbirds, 4-1 overall, have outscored three district opponents 180-0. 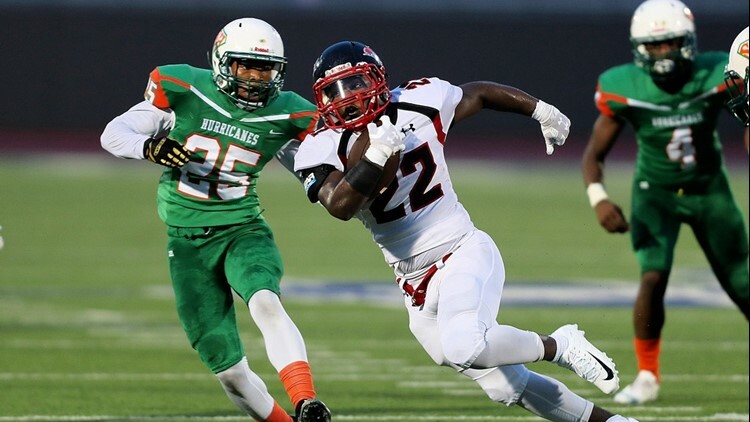 SAN ANTONIO – It wouldn’t be an exaggeration to say Wagner was practically crowned the football champion of its new district in February when the UIL announced its biennial realignment. After finding it increasingly difficult in recent years to match up with opponents in a highly competitive Class 6A district that included the likes of Judson, Steele and Smithson Valley, the Thunderbirds got instant relief from the UIL when they were dropped to the 5A ranks. Wagner moved into a new nine-team league with the seven San Antonio ISD schools and Veterans Memorial, the newest high school in the Judson ISD. Just like that, the Thunderbirds went from a district that can boast of seven state championships and more than 10 appearances in the state finals to a league they can dominate. And Wagner has done just that, jumping out to a 4-1 start that includes a 3-0 record in District 13-5A Division I. The Thunderbirds have looked unbeatable in district play, routing Sam Houston (55-0), Lanier (56-0) and Edison (69-0). That’s a combined 180-0, if you’re keeping score. While Wagner was a heavy favorite to win its first district title, the Thunderbirds still have had to prove it on the field. To their credit, they haven’t taken anybody lightly. “We went into the season knowing we were going to have a big target on our backs, that people were going to come after us,” senior quarterback Tobias Weaver said Thursday. “We knew a lot was going to be expected of us. We’re confident in our ability, but we don’t take anything for granted." “We respect everybody we play and we’re going to keep working as hard every day. We take on each game like a challenge. It’s another game. We don’t look ahead. Our goal is to be 1-0 after each game. It’s not about the other team. It’s about us trying to get better each week," Weaver said. Wagner plays Brackenridge (3-2, 2-1) in a district game at 7:30 p.m. Friday at the SAISD Sports Complex. Thunderbirds coach Charles Bruce expects Brack coach Willie Hall and the Eagles to throw everything but the kitchen sink at Wagner. The Thunderbirds’ only blemish in the first half of the season was a 35-28 loss to powerhouse Judson, No. 1 in the KENS5.com area rankings and No. 5 in the Associated Press 6A state poll. Wagner is No. 1 in the KENS5.com Sub-6A rankings. “The kids and the coaches have done a tremendous job,” Bruce said. “We’ve been working toward this thing for a long time. It’s just kind of all come together. The seniors have been programmed for four years, so they were here when we started building it." Considering the fight the Thunderbirds gave Judson in the Hammer Bowl, an argument could be made that Wagner is the second-best team in the San Antonio area. Bruce is too busy trying to keep his players focused on the next opponent to concern himself with such things. “At this point of the season, we’re not even in the playoffs yet,” Bruce said. “We’ve got to get better every week, get better every day. Today I’m talking to our players after school when we meet that there’s no sudden leap to greatness. It’s day by day, one brick at a time." Weaver, who started at quarterback last season, is the catalyst for a Slot-T offense averaging 44.4 points and 468.8 yards (384.4 rushing). 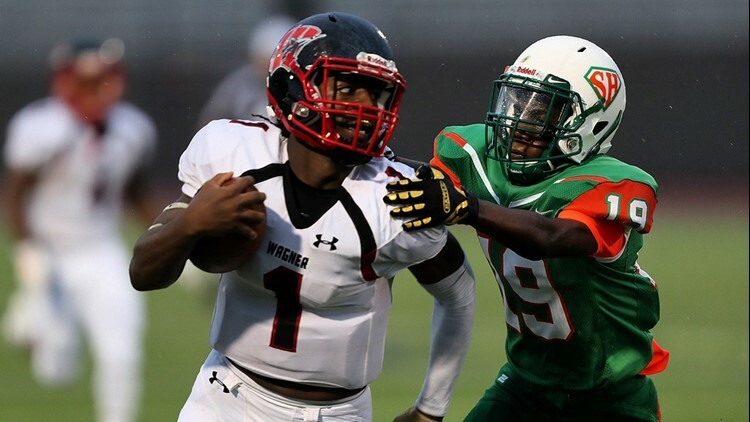 A classic dual-threat QB, Weaver has passed for 404 yards and seven touchdowns, without an interception, and rushed for 500 yards and seven TDs. Sophomore fullback L.J. Butler is also having an outstanding season, rushing for 604 yards in only 62 carries (9.7 average) and scoring 11 TDs. Wide receivers Joshua Cobbs and Trent Thibodaux also were cited by Bruce for their willingness to block. The Wagner defense is led by senior linebacker Max Arellano and senior free safety Kavon Barnes. Senior linebackers Greg Steptoe and Michael Turbin, and junior ends Cabron Clay and Marcus Henderson also have played well, Bruce said. “To me, Max is the sleeper of the group,” Bruce said. Jason Starin is Bruce’s offensive coordinator and James McDaniel runs the defense. A 1985 Judson graduate, Bruce was a wide receiver on the Rockets’ first state-championship team in 1983 and returned to his alma mater as an assistant coach in 2001. He played for Frank Arnold and D.W. Rutledge and worked for Jim Rackley, who succeeded Rutledge as head coach in 2001. Bruce, 51, started his career at East Central in 1992 as an assistant coach under Mike Morgan. He remained on Morgan’s staff until going to Judson, where he worked for five seasons. Bruce moved to Wagner as an assistant coach under former Judson defensive coordinator Pete Gibbens in 2006, when the Thunderbirds played their first season in school history. Bruce left Wagner in 2012 for a one-year stint on Mike Jinks’ staff at Steele, before returning when he hired to succeed Gibbens as head coach in 2013. Bruce went 13-37 in his first five seasons, but the Thunderbirds are only two victories away from posting their first winning campaign since going 6-5 in 2012. That was Gibbens’ last season. That’s also the last year Wagner made the playoffs. “We’ve always told the kids that they’ve got to trust us as coaches,” Bruce said. “They trust us and we trust them. This is part of the process. When I came back, I talked to our players of where we could be. But everybody has to buy in. Once you get the buy-in, then you’re great. Wagner has finished 4-6 each of the past two seasons. One of the tenets of the Thunderbirds’ program on Bruce’s watch has been accountability. “It’s not about the other team,” Bruce said. “It’s about us. We preached it then and we preach it now. If you’re in the locker room before the game or at halftime, I’m going to say the same thing. We have to make sure we take care of Wagner High School." Arellano left no doubt that the Thunderbirds feed off Bruce’s enthusiasm and passion for his job. On the other side, Brackenridge hosted KENS 5 during Friday morning's pep rally.